From walnut this high status marriage armoire was commissioned c1720 to celebrate a wedding. The farms around Rennes, Brittany were large and wealthy. Parents typically took their daughters reaching puberty as a signal to start preparing for her marriage. The trousseau consisted of a simple bed, embroidered linen which took years to accomplish and an armoire. 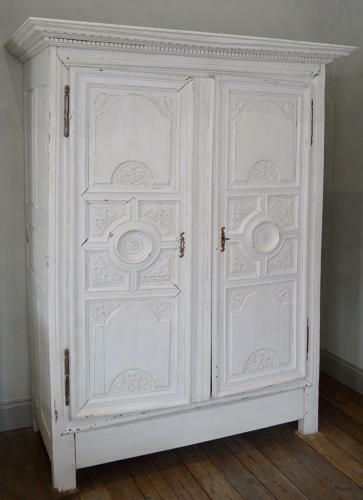 The armoire was delivered to the wedding feast for display on a cart before being reassembled in the newlyweds home. The wealthier the parents, the more elaborate the armoire. This one is as good as it gets. There is another Regence (1715-25) period Rennes armoire in the Ecomusee at Rennes but it is a poor second. The exotic crested birds which adorn each door are symbolic of Rennes from the mid 18thC and feature on much high status furniture, carved lintels and fireplaces of the period. The overall design is essentially Louis XIV with an excellent typically sweeping denticled cornice, 3 panelled doors and central rondels. The skirt typical of LXIV armoires has by now been lost and the bottom traverses becomes shaped in proceeding LXV pieces. Originally in walnut the piece has been painted in distemper paint sometime in its history. This is extraordinarily difficult to clean after a couple of generations of neglect and a fresh film has been applied before re-waxing. Considering it's 300 years old it is a light, exuberant piece ready to swallow most peoples entire wardrobe. Perfect for a bedroom with one shelf and a hanging rail. Dismantles for delivery. Seeing this facing you in bed when you open your eyes would be a good a way as any of starting the day.